The Pacers' identification and development of young players stagnated in the Paul George era and might have contributed to his exit. Indiana's kept first-round picks in the seven years between drafting and trading George: Miles Plumlee, Solomon Hill, Myles Turner, T.J. Leaf. 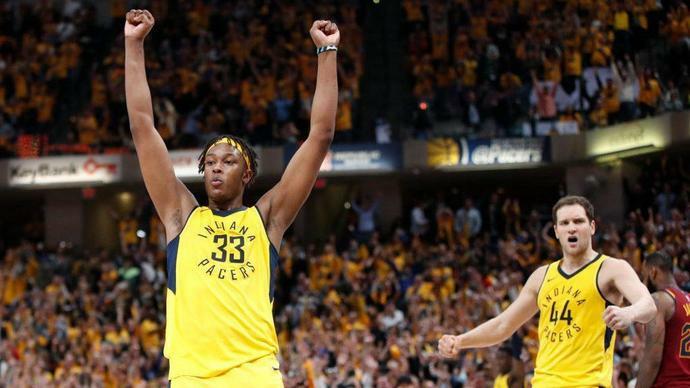 Turner is the lone hope to emerge as a secondary star, and though now it'd be next Victor Oladipo rather than George, the Pacers will pay Turner as such. That's a sizable deal, not just in terms of dollars but also opportunity cost. This will unnecessarily cut into Indiana's cap space next summer. Turner will begin the offseason counting against the cap at his 2019-20 salary, which based on the reported terms, will be between $17,857,143 and $22,727,273. If the Pacers didn't extend him and let him become a restricted free agent, they could have held him at $10,230,852, used their other cap space first then exceeded the cap to re-sign him with Bird Rights. The 22-year-old Turner can live up to this deal. He's a good 3-point shooter and shot-blocker. He must play with more force inside and either improve his foot speed or defensive recognition, ideally both. But he has plenty of tools for a modern center. The NBA Draft is still two months away, but the Boston Celtics are already busy doing their due diligence.